Glued insulated joints are used in tracks that meet certain requirements regarding stability, good tamping and sleeper quality. It consists of glass fibre cloth insulated fishplates, a corresponding number of insulated high-tensile bolts and end post made of insulating material. Being a client-centric organization, we are engaged in manufacturing Glued Insulated Rail Joints. We also Preferred Tender from Railway Vikas Nigam Limited(RVNL). 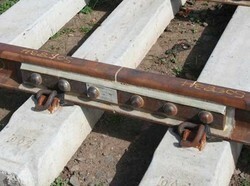 We offer a wide range of Glued Insulated Rail joints of different sections and DRG./SPECNS. These glued joints track circuiting on welded track & can move at higher speeds with less friction. In this joint, rails, fish plates, bolts and nuts are permanently bonded together with an insulating epoxy adhesive. Design Temp: Normal Temp:46°C to 95°C.